We begin with eyes wide open. Excitement, promise, and hope makes you feel this could be it. The one. The person we just might be spending the rest of our life with. It’s easy to get caught up in the bliss. Little annoyances get ignored. Just being together is enough. And then, reality sets in. And despite our best intentions, many relationships start to show cracks of not being able to withstand the ups and downs inherent in relationships once the blissful honeymoon stage has come and gone. As the challenging and complicated times start to swell and take over the good times, we find ourselves focused on the negative. Those annoyances we previously found cute, not so much. Being in this space leaves us feeling sad and drained. We yearn for the days gone by. What happened? And then we begin to question the relationship. Ourselves. You are not alone. Many people find themselves at the same place – at the proverbial fork in the road asking themselves, should I stay or should I go? What will be best for me? Why am I in this space of indecision? Simple questions with no easy answers. But, before you start to pack up your boxes, change your address, and head for the door, why not take the time to ask yourself some important questions so that whatever you decide in either direction, you do so knowing you did the necessary leg work to put you on a different and healthier path in your life? After all your decision can (and most likely) will be the game changer for you. Your pivot. Your tipping point. And seriously, aren’t you worth it? Isn’t your relationship worth it? So, take a minute. Actually, take several minutes to ask and answer these questions. Because in doing so, they will transform how you think about yourself and your relationship. The answers will help create greater insight and introspection so that whatever decision you make, you will be assured that you have done right by yourself. You have done the work. You have taken the time (because you are worth it and so is your relationship). 1.) What are the strengths of my relationship? Can I draw on those strengths now and overcome the struggles? 2.) What are the factors that I feel are the most difficult to overcome? Meaning – what are the “weakest links” in my relationship? 3.) What have been 3 or 4 of the happiest times in our relationship? 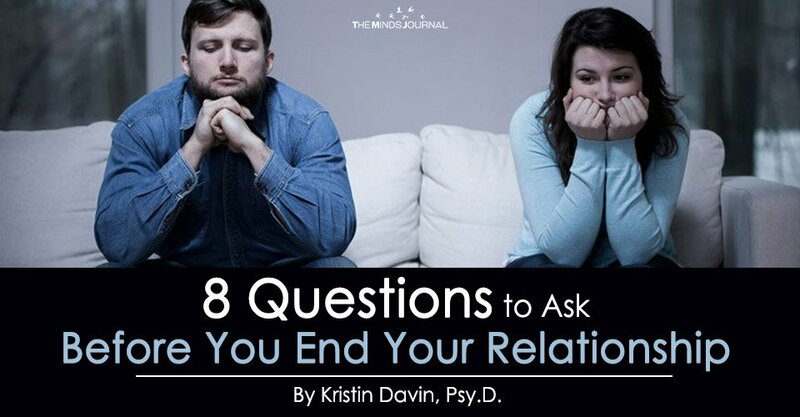 To answer this question, you need to think about the time together since you have been dating because couples who have strife find it difficult to identify a happy time. 4.) What were two of the most difficult times in your relationship that you overcame and why? How were you able to overcome them? This goes to strengths in your relationship but also helps you to remember the good times and the positives of your relationship. 5.) What are two or three of the values that you and your partner still share in common? Values are the bedrock of a person. It’s how we live our life. Do you still share the same values and if so, what are they? How will they impact your decision to stay or go?